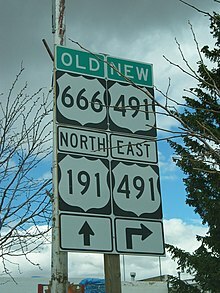 US Route 666 has been reassigned as US Route 491. The highway hasn't become any safer, but it did make some people feel better, for what it's worth. Running from Chicago to Los Angeles, there used to be a highway nicknamed “The Main Street of America”. This highway was better known then as U. S. Route 66, and although the highway ceased to exist in 1985, its fame still lives on as probably the best-known highway in America. Route 66 ran from east to west (well, it ran from northeast to southwest in some places, to be exact), so it was given an even number, in accordance with the way the Department of Transportation numbers highways. (North-south U. S. routes get odd numbers. This system also applies to U. S. Interstate highways, but not necessarily to state highways.) Over the years, some of the old U. S. highways have been decommissioned, usually in places where they cross big, empty spaces where an interstate highway would suit the needs of traffic (and highway budgets) better. This was the case with Route 66, which was replaced not by a single interstate, but with several: Interstates 55, 44, 40 and 15 cover much of its old path. When Route 66 disappeared, numbered highways that spurred off of it didn’t necessarily vanish. These spurs also follow a system that you see with modern highways. The easternmost spur from Route 66 was in central Kansas, so it was designated Route 166. Further west, the next spur was Route 266, etc. As Route 66 headed farther westward, the first number went higher, and logical progression of the system led to Route 666. Route 666 started to be called the “Devil’s Highway”, since a lot of people sincerely believed it was cursed. To support this belief, those who were afraid of the highway would point out that Route 666 had an unusually high number of traffic fatalities on it, which was actually true. Skeptics would counter that the fatality rate was much higher on the New Mexico stretch of the highway only, and that the highway had been criticized for not being adequately designed to handle the traffic that traveled on it. Evidence in favor of the skeptics: once the New Mexico stretch was improved, fatalities went down. One problem that both skeptics and hexakosioihexekontahexaphobiacs agreed on was that theft of Route 666 signs was a problem. Theft of highway signs is a problem everywhere, but as you can imagine, Route 666 signs were particularly popular targets for thieves. Between these thefts and the growing complaints from people who were afraid of the number 666, the Department of Transportation finally gave in and changed the number to U. S. 491. Sign theft has declined, and so have traffic fatalities—though the New Mexico Highway Patrol is quick to point out that highway fatalities are still high on the sections of the road that remain unimproved. These sections remain unimproved as a result of Congress blocking the spending on highway improvements in the American Recovery and Reinvestment Act (also known as “the stimulus”), initially passed in 2009. How can now-Route 491 finally be improved? Well, the devil is in the details.